OAKLAND — As members of victims’ families cried in a crowded courtroom Friday, former Your Black Muslim Bakery leader Yusuf Bey IV and an associate were sentenced to life in prison without parole for killing journalist Chauncey Bailey and two other men in 2007. “Never did I think in my wildest dreams Chauncey’s life would end because of a story,” Bailey’s former wife, Robin Hardin-Bailey, told Judge Thomas Reardon before he imposed consecutive life sentences on Bey IV and Antoine Mackey, both 25. Bailey “didn’t dislike you,” Hardin-Bailey said to Bey IV, who sat a few feet in front of her in shackles and a red jail jumpsuit, sometimes turning to watch her. “He was a journalist in his heart,” she said. The sentences cap a saga that captured national media attention and hastened the downfall of a notorious Oakland institution. A jury on June 9 convicted Bey IV of ordering Bailey’s killing and Mackey of helping Broussard carry it out. 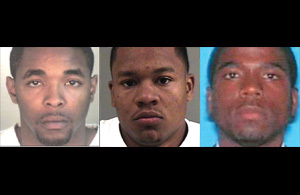 Bey IV was also convicted of ordering two other men, Michael Wills and Odell Roberson, shot dead in July 2007. Mackey was convicted of killing Wills; jurors couldn’t reach a verdict on whether Mackey was guilty of murder in Roberson’s death. Broussard, who testified for nine days against Bey IV and Mackey, received a 25-year sentence as a part of a plea bargain. Bey IV was sent to prison for three consecutive life terms and Mackey for two — one term for each man they were convicted of killing. They cannot be paroled. Lawyers for both said they would appeal. Neither Bey IV nor Mackey spoke during sentencing. But in a statement read by his attorney, Bey IV said he was an innocent victim of forces that were out to destroy the bakery. Bey IV’s late father, Yusuf Bey, opened the Oakland bakery in the early 1970s after splitting from the Nation of Islam, and built it up as a purported black empowerment organization. In an emotional statement, Wills’ mother recalled her son’s life and her pain at his death. Broussard said Bey IV and Mackey killed Wills, a 36-year-old sous chef, because he was white. “Why would someone order him murdered just because of his race? … This was a man who saw everyone as equal,” Robin Haugen said as Bey IV looked away. Mackey turned to glance at her. Bey IV and Mackey were not charged with a hate crime in Wills’ killing, but Reardon said he found a racial motivation for the slaying when considering punishment. “It is satisfying to know that the murder of a journalist has received a punishment that fits the crime, and will preclude them harming journalists and others in the future,” said Frank Smyth of the Committee to Protect Journalists. Outside court, Bey IV’s attorney, Gene Peretti, declined to discuss why Bey IV would say he was victim of unnamed people out to destroy the bakery while at the same time seeming to take some responsibility for the deaths. He said Bey IV’s position is that Broussard committed all three murders on his own. Bey IV is due back in court next month to set a trial date for a separate case in which he is charged with kidnapping two women and torturing one of them in a failed attempt to learn where a drug dealer hid money. –Odell Roberson, 31, killed July 8, 2007, because he was related to a man convicted of killing former Your Black Muslim Bakery leader Yusuf Bey IV’s brother. –Chauncey Bailey, 57, killed Aug. 2, 2007, to stop the Oakland Post editor from writing a story on financial troubles and internal strife at Your Black Muslim Bakery.